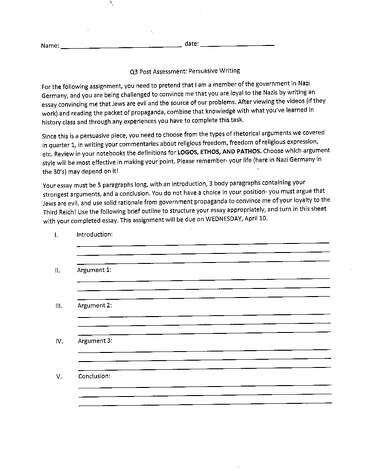 Missouri Education Watchdog: "Jews Are Evil" Writing Assignment. Is this Due to Common Core? "Jews Are Evil" Writing Assignment. Is this Due to Common Core? Is this Common Core at work, indoctrination or both? Or is it something else? The Albany school district is embroiled in controversy after a teacher assigned this assignment to students that requires them to write an essay that proves the writer is loyal to the German Nazi's and that "Jews are evil and the source of our problems." Students in some Albany High School English classes were asked this week as part of a persuasive writing assignment to make an abhorrent argument: "You must argue that Jews are evil, and use solid rationale from government propaganda to convince me of your loyalty to the Third Reich!" Students were asked to watch and read Nazi propaganda, then pretend their teacher was a Nazi government official who needed to be convinced of their loyalty. In five paragraphs, they were required to prove that Jews were the source of Germany's problems. Vanden Wyngaard said the exercise reflects the type of writing expected of students under the new Common Core curriculum, the tough new academic standards that require more sophisticated writing. Such assignments attempt to connect English with history and social studies. She said she understood the academic intent of the assignment — to make an argument based only on limited information at hand. To help with their writing, they were required to incorporate the elements of an argument identified by Aristotle, the ancient Greek philosopher. Students had to look up the definitions of "Logos" (persuasion by reasoning), "Pathos" (persuasion by emotional appeal) and "Ethos" (persuasion by the author's character) and choose one of those argument styles before writing. Would having students argue why Jews are evil constitute hate thought toward a specific group? Is this really due to Common Core curriculum/standards/assessments? If it is because of having to infuse English with history and social studies, this would be a prime example of why these "clearer, rigorous" standards should be tossed. Can the principal provide a standard backing up her statement? Is the main problem with these standards is how they are structured or lack of teacher training? A criticism of these standards is they operate with context not being important to lessons. The principal's statement bolsters that criticism. Read about how the Gettysburg Address is now being taught without context via Common Core and what a disaster it is: Another problem we found relates to the pedagogical method used in the Gettysburg Address exemplar that the Common Core calls “cold reading.” This gives students a text they have never seen and asks them to read it with no preliminary introduction. This mimics the conditions of a standardized test on which students are asked to read material they have never seen and answer multiple choice questions about the passage. I called the reporter who wrote this story and confirmed this teacher worksheet was teacher generated, not from a curriculum company. This teacher used the same bad judgment as did the teacher in Georgia writing a math problem incorporating historical references to slavery in which slaves picked oranges. Common Core implementation and standards are clearly a disaster. Is the lesson here is that cross curricular lessons are in fact not more rigorous or clearer? What kind of education is this that students have to come up with persuasive arguments with limited knowledge of the subject based on siding with a group set on the extermination of specific groups of people? Maybe "Logos, Pathos and Ethos" should be incorporated in an assignment after watching films and reading historical facts about the Holocaust camps and the millions of people who died at the hands of the Nazis. But why give students context? That's not important in the standards in which process over content is sacrosanct. Can you imagine if students are so good at debating that they convince people Jews are evil? What Pandora's Box is being opened by aligning to these standards?